People walk down a street flooded by Harvey as they evacuate their homes in Houston. As Hurricane Harvey approached the Texas coast last August, it was clear the storm would be one for the ages. The forecast, unfortunately, did not disappoint with the storm stalling and then spinning a lazy circle around the Houston metro area for days. 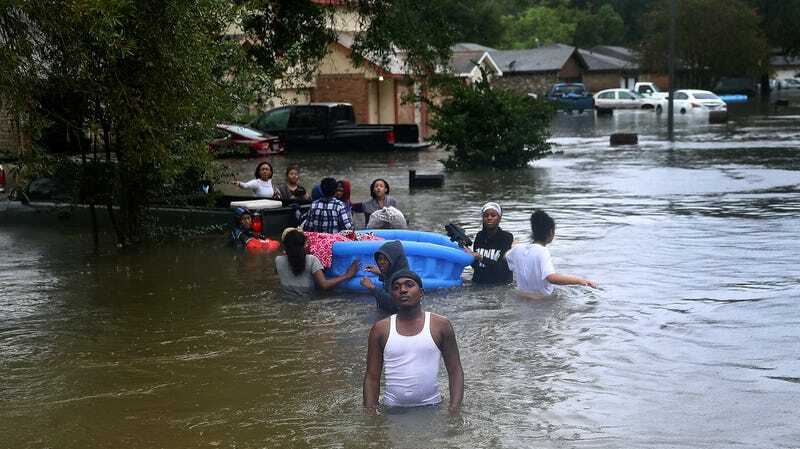 The result was catastrophic flooding in the city and surrounding area that caused an estimated $125 billion in damage. A new U.S. Geological Survey (USGS) report released on Monday puts a definitive stamp on that flooding and the rain that caused it. According to the report, there’s never been anything quite like Harvey. “Harvey was the most significant rainfall event in United States history in scope and rainfall totals since rainfall records began during the 1880s,” the authors wrote. weather stations, 74 stream gauges, and 2,123 high water marks across five river basins impacted by the storm. The results are astounding. The National Weather Service put out a report in the spring showing that Nederland, Texas is where the most prolific rains fell. The new report confirms that and lists it as the official new record for rainfall in the continental U.S.: a whopping 60.58 inches of rain fell. Nearby Groves got 60.54 inches, adding another datapoint to backup how extreme Harvey was. The previous record holder was Medina, another Texas town that got 48 inches of rain from Tropical Storm Amelia in 1978. Among the 74 stream gauges, 40 of them set new records for peak streamflow. At least two of them recorded streamflows that have a 0.2 percent chance of occurring in a given year while 30 others recorded water rushing at a rate that has a 1 percent chance of happening in a given year. That type of planning will be crucial as the people living in floodplains becoming increasingly at-risk of major inundations. Harvey’s epic rains were likely influenced by our changing climate. For every degree Celsius increase in temperature, the atmosphere can hold about seven percent more water vapor. The planet has warmed about a one degree Celsius since the start of the Industrial Revolution, and so it’s perhaps not shocking that extreme rainfall events have increased not just in Texas but across the U.S.
A study published in the aftermath of Harvey found that the odds of a storm of that magnitude have increased from one percent in pre-industrial times to six percent today due to rising greenhouse gases. By the end of the century, the odds a storm like Harvey hitting the area in a given year could rise as high as 18 percent.